"Does it bother you to see a man from New Jersey come in and try to take over your schools?" My friend and neighbor, who herself is from New Jersey (although she's lived in Raleigh for 15 years), posed this question to me recently about Wake County Board of Education Chairman Ron Margiotta. My response: "Yes, in fact, it does." Ironically, there's a district in Montclair, NJ, that's modeling its diversity policy after Wake County's former plan. Their plan uses both magnet schools and assignments that work to create school enrollments that mirror the demographics of the broader community to ensure a successful balance in each school. In all the hullabaloo about so-called neighborhood schools, it seems that our Yankee-transplants are forgetting (or choosing to ignore) that the success of Wake County's school system was a critical factor in what made our community such a successful and desirable location for said transplants. And while the diversity policy wasn't THE reason for our success -- effective teachers, strong leaders, regular parental involvement and many other factors are certainly at play -- no one has shown the first piece of evidence to suggest that eliminating the policy will raise student achievement for anyone in the district. I'm happy for transplants to serve in elected positions in Wake County and across North Carolina. I just wish that they'd take the time to study what works, research the gaps, talk with citizens, listen to experts and make informed decisions. And I want to believe that they're not seizing an opportunity for political gain or living in a fantasy that will ultimately harm our students and the quality of life in our community. For another view on this topic, see Barry Saunders' column from Tuesday's N&O. He's funnier than I am and definitely worth reading. Photo of transplanted school board members Debra Goldman, Chris Malone, John Tedesco and Ron Margiotta by N&O photographer Ted Richardson. I complain a fair amount about grocery shopping. Generally speaking, it's not my favorite activity -- it always takes longer and costs more than I expect. Adding kids to the mix doesn't help any -- between Pippi tossing her shoes overboard when I'm not looking or trying to wiggle out of the cart and Junius knocking things off the shelf and asking for every product featuring a Toy Story character, it's not a peaceful trip. Top that off with a complicated new two-story Harris Teeter and I'm about ready to stop shopping altogether. But even as I'm complaining, I realize how fortunate I am to be able to buy groceries every week for my family. Thanks to suggestions from friends, we decided to recognize our good fortune by hosting a mini food drive for the Kids Summer Stock program at the Food Bank of Central & Eastern North Carolina. The program provides summertime food for students who receive free and reduced-price breakfast and lunch during the school year -- for the thousands of students who qualify for those school meals, no school means no meals. For our recent neighborhood Third Friday Happy Hour, we simply asked friends to bring some items on the most-needed list -- we collected all the food at our house and delivered it the following week. And with less time and effort than it takes me to find my way through the grocery store, we were able to deliver 50 pounds of food to the Food Bank. Whether you love or hate grocery shopping -- or even if you're lucky enough not to have to do it -- I encourage you to make time for a mini food drive in your neighborhood, office, church or other group. It's easy to do, but it can make a world of difference for a family in need. The Kids Summer Stock food drive is a great program, but I do still like to complain. 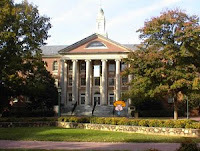 Check out my Open Letter to Harris Teeter at North Hills East over at Triangle Mamas. And if anyone from Harris Teeter is reading this, please send more coupons -- I used my last $20 coupon yesterday. Today we bring you a guest post from SpinPhD, also known around our house as "Daddy." Lately I’ve become acutely aware of firsts -- those milestone events that kick-off a lifetime of activity and life rhythms. In the last post, Convertible Girl wrote about Pippi’s first haircut. We took pictures, celebrated at Chick Fil A, called the grandparents and more. She felt like a celebrity and we couldn't believe how much she looked like a big girl all of a sudden. I think we make a big deal out of firsts because they are transformative. We are changed after the event. We can never go back. You can’t undo a first, no matter how much you might want to. All that really matters is what happens next. First baseball glove. Having a catch is a time honored father-son tradition and Junius has a major sports bug. We went to the store together, trying on several until he picked out a black leather boy-sized glove. We’ve already had many rounds of catch -- with many more to come. He was even out playing with his PopPop at 7:15 a.m. last week. 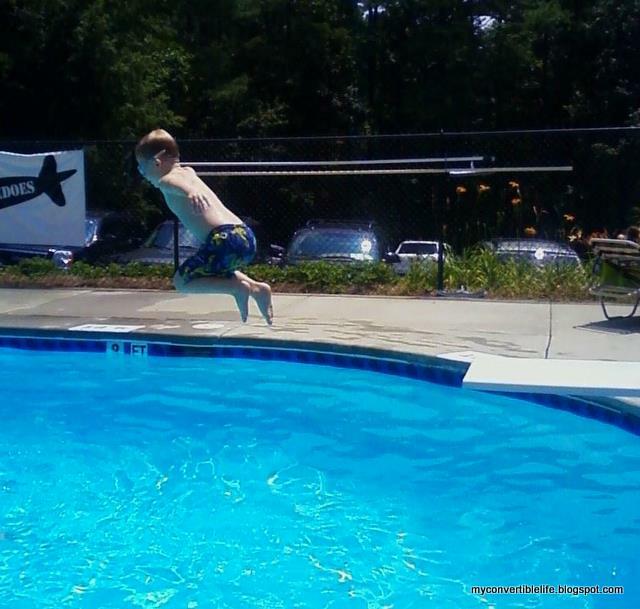 First jump off the diving board. 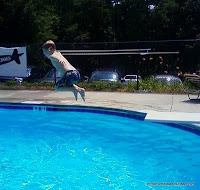 Junius has made quantum leaps in his swimming prowess this year, which turned into his first leap off the diving board (see photo). In his excitement, he nearly leaped over me, but splashed down safely and swam to the side with a little help. He was equally delighted and terrified. Then he did it again. First “earned” dollar. This followed his first week of chores – making his bed everyday, helping with the trash twice a week, taking out the recycling and “other duties as assigned.” He was thrilled with his first earned dollar, which included his first lesson in personal finance (also known as Saving for College). Maybe we should frame it and hang it on his wall? First purchase with his own money. Thanks to grandparents and other relatives, he’s saved a few dollars in his piggy bank (but not $21k as he previously thought). His first purchase? A ham biscuit from Biscuitville. Buy one, get one free. I ate the free one. First attempted bike ride without training wheels. He didn’t make it more than a few feet and still needs to remember to hold on to the handle bars all of the time (as opposed to grabbing hold of Dad), but that’s beside the point. He tried. He tried really hard. Although he didn’t ride completely solo, he now knows some things are harder than they look. And that trying means you don’t always succeed. Nonetheless, he’ll be back up again on that bike soon. I just know it…And then he’ll make his first real solo bike ride. So many more firsts lie ahead. Watch out Neil Armstrong. Here comes Junius T. Bugg…. 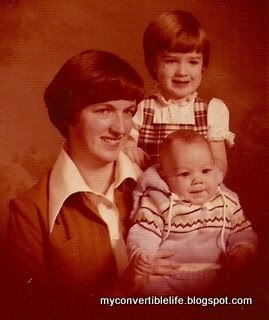 Back in the day, my mom and I had nearly matching haircuts. Dorothy Hamill-style, natch -- I mean, it was the 70s. 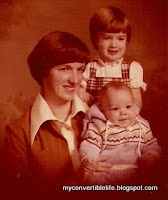 This was us (plus my brother, who did not have the matching haircut, much to his relief). As I got older, I grew my hair out long, then cut it short, then long-ish, then very short, then long again, then perms (ah, the 80s), then short-ish again, then very long and finally landed in some version of my current 'do after college. Around these parts, I believe the technical term for my style is "the Raleigh bob," although I like to think my cut has a little more sass than that. I tell you all of this as a set-up for what Pippi did for the first time yesterday. is pretty much the same haircut I have now. And motherhood comes full circle once again. Although I don't recall my mom teaching me to say, "Pippi has a sassy haircut!" when I was a girl. As if the ice cream parties, the babysitting co-op, the craft projects, the bunco evenings, the poker nights, the Third Friday Happy Hours, the fundraisers and the meal calendars weren't enough fabulousness, last weekend brought my Lakemont love to a whole new over-the-top level. 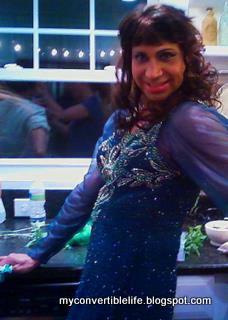 Yes, that's a drag queen. In my friend's kitchen during a break between sets. You know, cause that's how we roll over here in midtown. S/he was there for my friend (who is also her/his friend) because said friend was in need of some cheering up. And how better to find your smile than with a house full of dancing girlfriends and gay men, a chilled pitcher of cosmojitos, and a gorgeous man wearing sequins and false eyelashes belting out lip-synched versions of Whitney Houston songs? What? That's not what you do in your neighborhood? Well, too bad -- because it rocked. Even after an anonymous neighbor (who was understandably bothered by the decibel level from the backyard around midnight) called the police. Guess we'll just have to start a little earlier next time so as not to violate the noise curfew. Because I'm sure there will be a next time. In preparation for Junius's kindergarten debut in August, we had our parent meeting last night at his school. I was doing fine until the principal stood up to say a few words at the end of the group session before sending us off to see the classrooms. "I used to be a kindergarten teacher," she said. "So I know what it means that you are trusting us with your babies." At that point, the tears started to well up in my eyes. "But while they're here with us," she continued, "we promise to take very good care of your babies and to honor the trust that you're placing in us." I was already fighting hard against the tears when I made the mistake of looking at my girlfriend across the room -- her younger son is starting kindergarten this year, too, and her eyes were red and wet as she held her "baby" in her lap. So in recognition of the fact that my baby is about to be a big-boy-kindergartener, I share with you five of vestiges of his baby voice that still linger in his speech. Most of the time, he talks like a big kid -- but there are a few words that he still says in his own funny little way and I'm so glad he hasn't outgrown them just yet. Funiture: I don't know why he never puts the "r" in the middle of "furniture," but given our families' love of rearranging rooms, I think "fun-iture" is actually more appropriate. And it sounds adorable. Bery: Somehow, the letter "v" is hard to say at the beginning of words, so it comes out sounding like a "b" instead. It's particularly cute when he says something like, "Mom? I am bery tough and bery strong." Keel: The fact that he's trying to use the word "kill" is less than adorable, but thankfully it takes some of the edge off the word to hear him drawl it out with such a twang. Go infinity...: So this one is a phrase instead of a word, but it cracks me up that he always says "Go infinity... and beyond" instead of the actual Buzz Lightyear line of "To infinity..." I'm not sure how it happened, but even funnier was the very first time he declared it as "Holy Trinity... and beyond!" I'm sure his preschool teachers at Holy Trinity Episcopal would have been proud. P.S. That photo is Junius with my brother at the Super Dylan walk. My boy might be all big and tough, but he still wants to ride on his uncle's shoulders -- so maybe he's not growing up too fast after all. In honor of graduation season (and because I can't seem to carve out time to write much these days), I'm pulling a post out of the archive today -- this is the speech I shared with classmates at our J-school graduation eight years ago. Apologies to any of you who heard it the first time -- feel free to skip this post and wait for the next one. Hi – my name is C... and I am a super geek. I have spent about 25 of my 29 years in school, either as a student or a teacher. But I think the past two years that I have spent in the master’s program in the School of Journalism and Mass Communication have pushed me over the limit. I can no longer watch the evening news without critiquing the quality of the content or the wardrobe and mannerisms of the news anchors. Should that meteorologist really be wearing a brown shirt with a navy blue suit? I cannot read the newspaper without grumbling about widows and orphans left dangling alone in columns of text, misspelled words leaping out of cutlines, and statistics that simply don’t add up. I comment as much on the layout of feature stories as I do on the content of the material. I am incapable of looking at business cards or letterhead without wondering who designed the company’s logo and why they chose to use Times New Roman instead of a nice, clean sans serif font. I find myself analyzing the design of annual reports, worrying more about whether they used color in sidebars than whether Arthur Andersen was the auditor. I feel compelled to ask business owners if they have a crisis communication plan and whether they know their three key messages and can communicate their brand in a single, easy-to-remember phrase. I can spot a video news release in about two seconds. If you’re laughing, then my sympathies go out to you – because you, too, are a super geek. You may not be ready to admit it in front of the world, but trust me – you’re a super geek too. And admitting that you are a super geek is the first step. But I believe there is hope for us all. As we leave the fantasy world that is Chapel Hill and go out to jobs, internships, more schooling or plans yet unknown, we can actually use our super-geekness to our advantage. For those of you staying in academia – as graduate students or professors – you will be permanently surrounded by fellow super geeks and will find yourself basking in the glow of geekdom. For those of you leaving the ivory tower for industry, you may have to learn to hide your geekier qualities, but the knowledge will certainly come in handy. Our years at Carolina have trained us well. We will be good at the careers we choose. And we will always remember this place, these people, these years with warm hearts and happy smiles. So before I say farewell to my life in Carroll Hall, I’d like to thank all of you – my friends and family and classmates and teachers – for helping me along the way. I would particularly like to thank the Park Foundation for their generous fellowship program, my parents for always believing in me and for trusting my decisions, even when they didn’t seem financially sound, and my wonderful husband, whose presence single-handedly made this whole graduate school experience worthwhile. By the way, that image isn't me. But a girl can dream, right? Now I'm taking my tired arms (and a lot of ibuprofen) to the beach for a few days to recover. Hope to be back on a better blogging schedule when I return.